Occupy Wall Street, Charlie Brown! 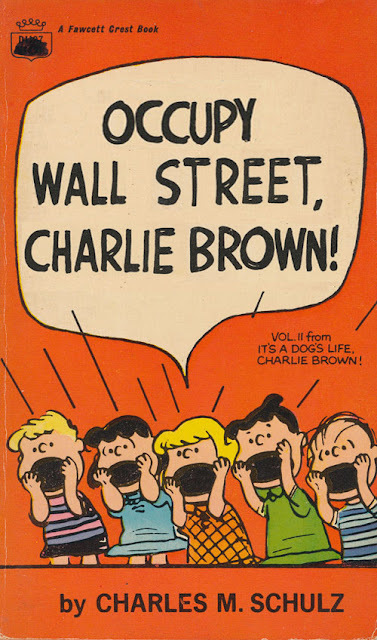 Meanwhile, in a parallel universe, Charles M Schulz has just published his new book – Occupy Wall Street, Charlie Brown! In a move intended to incite the youth of today to rebel against the capitalist system, 89 year old Schulz (for that is how old he is in the other place) has abandoned subliminal messages and gone straight for the metaphorical jugular. Or has he? In fact this is the work of Tony Medeiros and is featured on his website Paperback Charlie Brown. Without wanting to make the feeblest of jokes, but unable to resist it, the website does what it says on the cover. Medeiros has created a set of lost Charlie Brown books which, while parody, certainly mirror our times. As well as Charlie Brown and his cohorts, you will come across a number of familiar faces from Caspar the (not so) friendly ghost, Stewie from Family Guy and even Freddy Krueger. A quick heads up though – not all of Medeiros’ creations are completely one hundred percent family friendly, so you may not want to take a look if you have a child pestering sat next to you. Some of these new books might take some explaining! Click on the book cover to take a look at Charlie Brown at his most dissident.